As Josh and Brandi Reyes planned their family, having a special needs child wasn’t “on their radar.” Yet, God in His wisdom knew the blessing that Seth, their Down’s Syndrome son, would be. Through S eth, Josh and Brandi learned the ways to minister to their son and, then, other special needs children too. 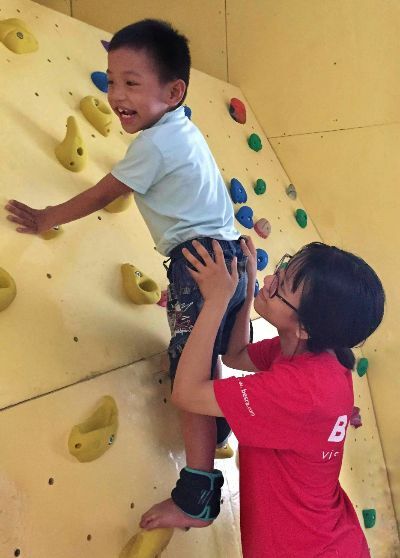 That revelation led Josh to Vietnam to build a climbing wall (Seth’s Wall) at Orphan Voice’s Hope Therapy Center. He wanted others to gain the “climbing wall benefits” that Seth had gained. Through climbing, Seth’s muscles, character, perseverance and passion had all grown! Today, Caroline Mrowiec, MOT, and her two staff and three helpers, assist 66 children who regularly attend Orphan Voice’s therapy centers. In some cases, grandmoms bring their loved ones on old motorbikes. In other cases, Orphan Voice’s van transports both. There are over 600 special needs children who haven’t yet had a chance for therapy or to experience that love. They are unreached! Will you invest $50, $25, $10 or another amount of your choosing to ensure that the Love of Christ reaches them in practical, therapeutic ways? To do so, donate online HERE to invest today. Thank you! Promise House Has Talent 2019 is over! At the competition, each child shared his or her gift: some danced or sang, others cooked or arranged flowers. Others recited poetry. Watch three minutes of competition highlights HERE. Children can’t develop talents if they’re physically or emotionally abused or hungry. Sadly, some of these precious ones suffered in those ways. More than one experienced sexual abuse or failed attempts at it; one had to beg for food; another, as a form of discipline, had his wrists tied behind his back and was hoisted in the air by a rope looped under his armpits. These children were defenseless. It changed as Orphan Voice partners intervened. They loved them enough to make them safe and secure. Yes, an orphanage isn’t God’s Plan A, but for these children, it’s needed. Orphan Voice partners have provided the love, care, prayers, and funding to give them a normal life – a life where they can play, develop their talents and thrive. Promise House is not fully funded. In fact, our largest Promise House supporter (an institution) is withdrawing from orphanage support in all countries in which they operate. That affects our children, of course. A church, Sunday school or individual can “adopt” the Promise House children, send volunteers and dirty their hands in practical ways. Email tony.brewer@orphanvoice.org if your church or group would like to do so. For the rest of us, can you invest $50, $25, $10 or another amount of your choosing into these children’s lives? Please donate online HERE. Imagine loving your son but knowing that he won’t learn to read. Would you fear for his future? Gia was born deaf. There are no signing teachers in his village. His parents wept – and prayed. Their prayers and the generous hearts of Orphan Voice partners collided! They learned of New Beginnings School for the Deaf and enrolled Gia. Then they met Mai and Hanh, New Beginning’s teachers. Mai and Hanh teach reading and math, yes, but they also guide their students spiritually. Can you help us equip these children educationally and spiritually? Please invest your gift of $50, $25, $10 or another amount of your choosing to give them a future and a hope. Donate HERE. Thank you! Orphan Voice Partners: Improving Special Needs Lives! Being single with a child on the way is hard. It’s harder when you’re a single mom and you have no job. All this describes Hieu’s life as her son, Ho, entered the world. Praise God, Ho was born generally healthy, and, as a 1 year old, is active, friendly and loves to “talk.” That “talk,” however, has always been garbled because of his cleft lip and cleft palate. Soon after Ho’s birth, Hieu was able to get a waitress job at a roadside noodle shop, which eased the financial pressure she felt. Her 3,000,000 VND ($130 USD) monthly salary was enough to feed her son and mother, but just. It certainly wasn’t enough to get the corrective surgery that Ho needed. Travel expenses, food, and medical costs would eat up 6-7 month’s salary, and Hieu just couldn’t do it. Tears of helplessness flowed. That’s when Orphan Voice partners stepped up. On January 2, Hieu and Ho traveled in an Orphan Voice van to Hue General Hospital for the coveted surgery. After a week in the hospital taking antibiotics to clear an infection, Ho’s lip was repaired. He’s still in the healing process, but see the difference for yourself! That’s what Orphan Voice partners do! They bless, they encourage, they lift the lowly, they fix things! When An was born and grew, Tuyet marveled. She yearned to know her beautiful granddaughter – to understand her personality, what foods she liked, what she liked to do. She was full of dreams for that baby girl. But a severe and prolonged fever when An was 6 months old changed those dreams. The fever brought with it epilepsy, cerebral palsy and mental and physical disabilities. Today, An can’t hold up her head without help. Since An’s parents both work, daily care for An, and her little sister, Nhi, falls to elderly Tuyet. Her love is great for her granddaughters, but the burden, and her advancing years, are also great. Today, thanks to Orphan Voice partners and Hope Therapy Center staff, Tuyet is blessed with 5-6 hours of weekly respite care. Therapists provide life-changing therapy which is improving the quality of An’s life. Additionally, Hope Therapy Center provides home equipment to make An and Tuyet’s lives more manageable and comfortable. Australian therapists just fitted An with her own wheelchair! There are many more children who need our help. Social workers tell us that 600 special needs children live in one district alone! Currently, Orphan Voice is serving 54 of these children. So we need your help to reach the rest. In rural Quang Nam Province, deaf children don’t go to school because public schools don’t provide signing teachers. And because of poverty, parents of the deaf cannot send their children to larger cities where deaf services are available. Therefore, deaf children grow up without learning to sign, are unable to communicate with others, and are without math and other academic skills. They are often abused, even sexually abused. When Orphan Voice partners opened New Beginning Scool for the Deaf, deaf students clamored to come. One student, when teased by his father that he wouldn’t take him to school the next day, left his home on foot at 4:00 the next morning to be sure that he didn’t miss school. Another student, when unsure that her father would allow her to attend, cut enough grass for the family cow to last several days, so that he wouldn’t have a reason to keep her at home. Indeed, one need only walk into the New Beginning’s classroom to see the students’ joy and eagerness. And they’re fun to watch. Click HERE to see these students and their teacher in action! Darol Kubacz is a decorated Army veteran who suffered a spinal cord injury while serving his country. Although a paraplegic as a result, he is active in ministry and a world-class athlete- one who has climbed Mount Kilimanjaro. Darol and his wife, Cheryl, love the deaf children at New Beginnings School for the Deaf. A few months ago, Darol led a team comprised of men and women from several States to Phu Ninh. The team held a special olympics for the children of Phu Ninh Therapy Center, Hope Therapy Center and New Beginnings School for the Deaf. The children loved it! Click HERE to hear Darol and Cheryl’s message for you! We’ve talked about this trip several times with you. This is our last email about it. We think it’s time. We need to finalize plans! If you’re one of the “AHH girls or boys,” God most likely took your parents to an orphanage to get you. If you’re an “AHH parent,” God most likely took you to an orphanage where you first laid eyes on one of the greatest loves of your life. That orphanage was a poor place, maybe a dirty place, maybe a smelly place, perhaps a place that you felt was lacking in love. But on that day, it was a place where God resided and where He met you. His goodness and His Presence were there with you that day in a special way. Now, after the passage of many years, how about both parent(s) and child, or either alone, traveling to Vietnam to minister to orphans and vulnerable children – to minister to “the least of these” together? How about meeting that same faithful and good God in an orphanage for a second time? Many have expressed interest in this unique trip. It’s time to decide so that we can determine the team and make preparations. Therefore, We need to hear from you by January 30. This will be the most blessed and amazing trip of your life. God is in it and where He is, there is joy! Email Don today! *The transportation cost is calculated by taking the total van rental and dividing it among the team members. This estimate is based on 12 team members. Please be aware that personal purchases are not included in the Total Cost Estimate. Any souvenirs, extra toiletries or other personal purchases are not accounted for. Orphan Voice has talked with a travel agency called Mission Nation Travel. We recommend that agency if you are looking for an agency to handle all your travel arrangements. In your email, ask Don for their contact information. Orphan Voice does not require you to work with Mission Nation Travel, as we know that some of you are internet savvy and can book your own flights and take care of your own visa. In the event that you book your own flight, we will simply give you the date that you need to be in Danang. Remember though, that there is blessing in traveling together! Eight year old Tro’s life began well, but by the age of four his dad and then his caregiver grandparents were dead. At that time, a drug addict entered his life. This abuser forced Tro to beg in order to feed his habit. If Tro didn’t beg enough cash, the man beat or starved him. His mother couldn’t protect her son from her “boyfriend.” To protect himself, four year old Tro often slept on concrete in the market. Fast forward four years. Tro eats rice, fish and vegetables until full – three times daily. He sleeps in a bed with a blanket – under roof. Caregivers hug instead of beat him. He’s no longer alone. How did his life change so? Tro was born into a poor, mountain family, but his needs were met. The addict “boyfriend” forced Tro to beg to feed his habit. If he didn’t beg enough, the abuser withheld food. Tro experienced the sharp pains of hunger. Flesh disappeared from an already thin body. Some days, he had only water to drink. Today, Tro weighs enough. Each morning, he drinks milk and eats banh my (bread), eggs and rice. At noon, he rushes to Promise House Group Home from school where steaming bowls of rice, spring rolls, pork, and fish await him. He wolfs it down. After school, Promise House cooks greet him with more rice, beef, morning glory vegetables, green beans, bread and fruit. At every meal, he eats to the full. Imagine yourself as that five-year-old boy. Could you or I have comprehended what was happening? Or made any sense of it? Precious Tro could only react. He could only rebel against his circumstances. To protect himself from beatings, he slept away from “home.” In the Central Highlands, the temperature falls into the 50s, even the 40s. He learned to sleep on concrete in the market or on the ground along the road. The room where Tro now sleeps is above the Promise House kitchen. He likes sleeping there because of the murals on the walls. A bathroom, which he learned to use, is only four yards away. He also showers – a new experience! His bed’s warm blankets engulf him during the cold, rainy season. Their softness comforts him. But the lingering smells from below bring the most comfort! At night, he can still smell the pork, rice and vegetables that he ate for supper. Best of all, he knows that more food awaits him when he wakes. How could a five year old brain in a five year old boy comprehend being beaten for failing to beg enough money? Did Tro think that he was the wrongdoer? Didn’t God create five year olds to see their parents as always right? How could he comprehend being threatened with a knife – of being chased by a man holding a knife? Surely he wondered why his mother didn’t protect him. Tro was unable to comprehend. That’s just the way life was. Vu is a compassionate man, a family man. He lives in Danang and drives tourists, round trip, to the Loatian border three times each week. He drives them to Tro’s village, where an immigration post allowing them to visit Laos, is located. Over several months, Vu noticed a painfully thin, young boy begging money at the gas station where he bought fuel for his van. Vu sometimes bought him food. The boy always seemed to be around. His face was dirty, he smelled bad and he wore ragged and soiled clothes. Surely, “he’s an orphan,” thought Vu. Vu asked villagers about the “orphan.” He learned that the boy’s name was Tro and about his plight. Wanting to help, Vu asked a government friend in Danang for advice. 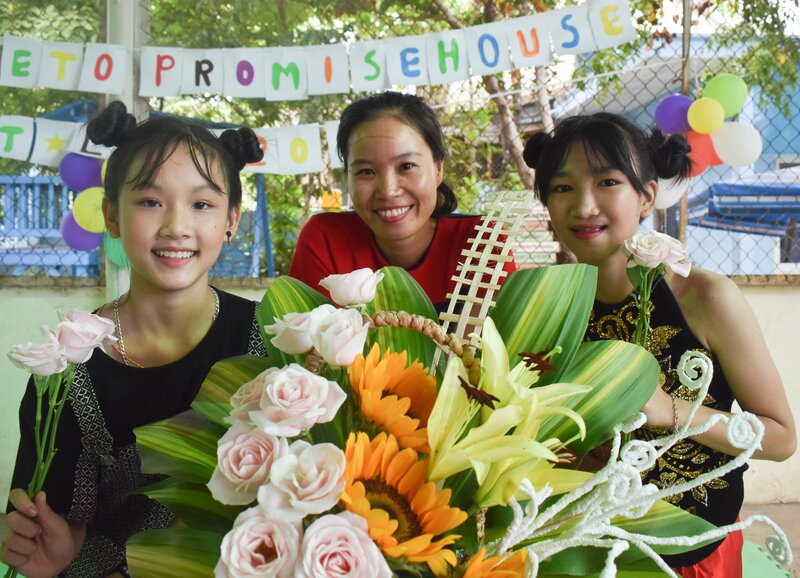 The government worker recommended Promise House as a place of safety for orphans. Vu took charge. He decided to take Tro to Promise House. He first obtained the mother’s consent. Then, permission from the city of Danang. Within weeks, he led Tro into the Promise House gate! In doing so, he opened a wonderful new world for Tro – a world where he could be a child again! The big day arrived! Tro again didn’t understand all that was happening, but he was HAPPY. He was with Vu going to a better place! Vietnamese children attend school all day by age four. Tro, now eight years old, attends school for the first time. He’s behind his classmates, but he loves it. And he has a loving teacher. Miss Linh invests extra time in him, helping him catch up. He needs the extra help. He’s never learned the Vietnamese alphabet! But now he’s to the letter E! Other cerebral palsy, deaf, cleft lip children and orphans – like Tro – need you. At year’s end, will you invest generously into their lives? Most of us can invest $50, $100 or even $250 into the lives of “the least of these.” Others can invest $500, $1,000 or $5,000 or even more. Be their hero today! Invest online HERE. Bao, born with CP, lost his mom four months ago to cancer. And Bao’s dad – well, after his wife’s death, he withdrew from the family. Of necessity, Bao’s elderly grandmother now cares for him alone. When village elders saw the family’s struggle, they recommended that Bao go to Orphan Voice’s Phu Ninh Therapy Center. Desperate for help, Grandma took Bao, and after evaluation, he was accepted into the therapy program. Will Bao gain motor functions through therapy in the coming months? Yes. We know that based on 7 years of Center operation. Will he make huge developmental gains? Maybe not. Bao’s CP is severe. But gains he will surely make! He will also gain self-esteem and self-respect. Grandma’s life is already easier and happier. With the respite help she receives when Bao is in therapy, she has more energy and is better able to give him her best – to provide the needed love and care at home. Orphan Voice partners – you’re champs! The therapists’ hands laid on Bao are really your hands. You give that exhausted grandmother badly needed respite time, so that she, in turn, has the strength to provide home care. It’s all because of you! Phu Ninh Therapy Center exists only because of the generosity of you, our partners. Would you sow into Bao’s life and others like him? Can you invest $50, $100, $250, $500 or another amount today? Thank you. They need you! Please sow as generously as you can HERE . Or mail your investment to Orphan Voice, P.O. Box 910410, Lexington, Kentucky 40591. No Orphanage In Their Future! Cuc’s husband is disabled. A year ago, she needed to provide for her two, school-age daughters with the $1.75 per day that she worked long hours to earn (See August’s Ministry Update). It seemed that there was always “more month than money.” At her most difficult time, she considered placing her beloved daughters in an orphanage, so that they could have better food and go to school. But God intervened in her life and she didn’t lose her daughters. Instead, God used Orphan Voice’s Building Strong Families program to transform Cuc’s life. Building Strong Families paid for her husband’s medical care. Building Strong Families staff provided mentoring on marriage and child discipline. Then, experts worked with Cuc to create a business plan to expand her small business. Cuc helped create the plan and then she “worked the plan.” As a result, her business grew dramatically! Her daily income rose from $1.75 to $7.25 per day! The thought of placing her daughters in an orphanage vanished! Because of God working through you and the local Vietnamese church to encourage and help Cuc, her family is stable! Thirteen families have completed the Building Strong Families program. With each family, the local church has shared Jesus’ love! Three of the families dropped out of Building Strong Families, but check out (below) the success of the other ten families! We are expanding our Building Strong Families program to four other Southeast Asian nations where we will work with local church partners. Working with the local church, our goal is to invest in 100 at-risk families in Nepal, Thailand, India and Laos. The 18 month program for each family will cost $1500. Help us meet our investment goal! To do so, donate HERE. Or mail your investment to Orphan Voice, P.O. Box 910410, Lexington, Kentucky 40591. Thank you! For years, Sy drove an 18-wheeler from Danang to Saigon carrying freight. From Danang to Saigon is 700 miles – and it took Sy 20-22 hours of driving on Vietnam’s congested National Road to get there! Little wonder that Sy wanted a driving job to enable him to be with his family more. He also wanted to use his driving skills for something more meaningful. While he didn’t know it, Orphan Voice was also looking for a driver! Several weeks ago Sy came on staff! Sy now spends his days transporting special needs children from their homes to Hope Therapy Center and then back home. For some of the children, he carries them from their house to the van, from the van to the Center and back to the van again when their therapy session is over. As you can see, he loves his job ! Five years ago, Hau left his poverty-stricken village for the big city. It wasn’t the lure of Saigon’s lights that drew him, but rather the promise of high-paying work. He dreamed to “have something and be somebody.” To accomplish that, he had to leave his village. A “hit and run” motorbike driver, however, turned Hau’s dreams into a nightmare. As he walked to work one morning in Saigon, the reckless driver struck him from behind – and then sped off. Hau crashed to the asphalt, and couldn’t get up. Indeed, others had to lift him and carry him back to his room. He was not to walk for many months. After the tragedy, Hau returned to his parents’ home and sank into depression. A neighbor donated a wheelchair which helped a little. Each morning, Hau’s dad pushed him to the yard where he spent the day watching others pass by. He had little hope. After several months of self-pity, a friend told Hau about the Phu Ninh Therapy Center. The neighbor’s words sparked hope in Hau’s heart! Maybe this was the way! Hau came to the Center. He proved himself to be faithful and hard-working – and it began to pay off. Gradually, he gained strength, and after several months, he could walk with a walker. He continued to work and gain strength. Finally, two years after his accident, he could walk unassisted again! Hau has not returned to his pre-accident mobility, and he may never do so. But, recently, something happened that changed his life! Hau met a new friend. Patrick O’Connor traveled to Phu Ninh Therapy Center as part of The Encouragers Friendship Team to conduct a “Special Olympics” day for the Ph Ninh children. Patrick has his own incredible story, but as you can see, he and Hau became friends. Can you empathize with Hau for a moment? Imagine the accomplishment he feels at being able to help Patrick – when not so long ago, he couldn’t. If you can imagine it as an Orphan Voice partner, receive blessing! You made it possible! It might be a cleft-lip child, a cerebral palsy child or a deaf child: can you invest $50, $100, $250, $500 or another amount into their lives today. They have no one else to turn to. To invest in their lives, donate HERE. Or mail your investment to Orphan Voice, P.O. Box 910410, Lexington, Kentucky 40591. They came from all over the United States. Darol, Cheryl, Ben, Brenda, Gerry, Kim, Patrick, Ignace and Troy came to bless. They came to love. Enjoy seeing the team have fun with New Beginnings School for the Deaf and Phu Ninh Therapy Center children! Like all parents, Huy’s mom and dad were overjoyed at his birth. They were proud! They beamed! Truly, Huy was the “star of the show” so far as his parents, grandparents and village neighbors were concerned. However, after 7 months, Huy’s parents began to suspect that something was wrong. And even though Danang was a two hour plus bus ride from their village home, they took Huy to a Danang Hospital for examination. There, to their surprise and dismay, doctors reported that Huy was deaf. The life of rural Vietnam’s, special needs children can be hard. Nowhere is this better seen than in the lives of rural-born deaf children. In Huy’s village, there resided no one who could teach him or his parents to sign. Huy’s mom and dad couldn’t send him to “the big city” where deaf services were available. As a result, from age one, when Huy’s diagnosis was confirmed by a second doctor, until he was 11 years old, Huy never attended school, didn’t learn to read, and never learned even basic math. He didn’t communicate with anyone outside his immediate family – and even with his mom and dad, he didn’t communicate well. When Huy’s dad learned of New Beginnings School for the Deaf recently, he immediately came to the school and asked Teacher Mai if Huy could attend. In fact, he pleaded with her. So even though New Beginnings’s school year has already begun, Huy was admitted. Huy’s just getting started and must catch up. Please pray for him (and a second new child) as they begin to learn Vietnamese sign language, reading, math and character development. Thank you! New Beginnings now teaches 12 children each day. The school depends on your prayers and your investment, to pay the bills. Can you invest $50, $100 or $250 in one of these 12 deaf children today? Please do so and Donate Here. Or mail your support to Orphan Voice, P.O. Box 910410, Lexington, Kentucky 40591. Thank you! “Would my girls be better off if they lived at the local orphanage?” So Cuc, a hard-working but struggling mother, thought many times over the years. Cuc loved her daughters, Ha and Thu. If they lived at the orphanage, she would miss them but maybe she could visit from time to time and bring them their favorite food. She had heard good things about the orphanage. It was supported by rich foreigners. Last year, due to really hard times, that “orphanage thought” passed through her mind more often than usual – and it always made her sad. Cuc’s husband is disabled, does not work and therefore does not help pay the bills. Cuc herself is uneducated, with little by way of marketable skills. Truly their lives have been hard. 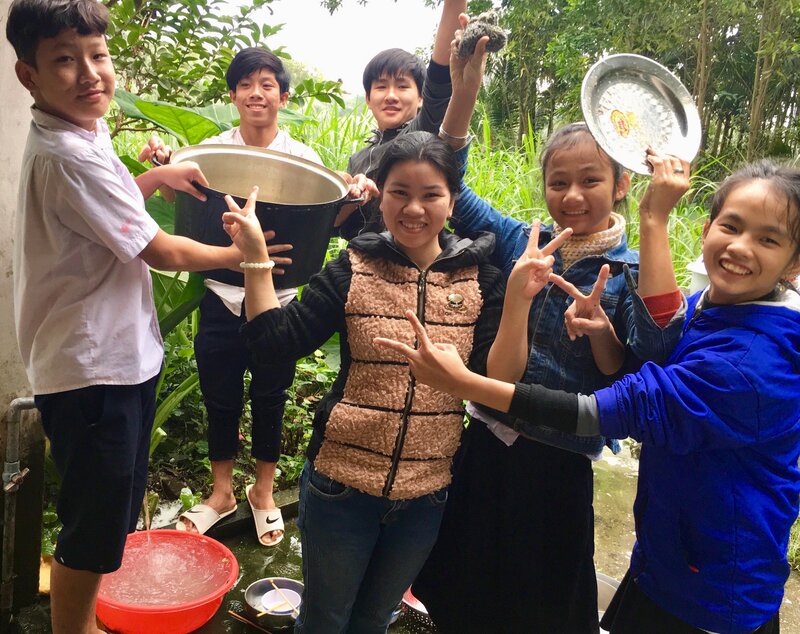 Ha and Thu attend school but have not had the benefit of the all-important tutors (without tutoring, which is built into the Vietnamese educational system, students may not proceed beyond 8th grade). Their grades were therefore poor. The girls never knew a dentist. Before entering Orphan Voice’s Keeping Families Together program, Cuc bought fruit, bread, and other food from a local store and walked the city streets hawking the food. Her inventory was what she could carry. The work was hard and hot. She sometimes sold her food; sometimes not. Earnings were meager. Over time, she convinced a friend to allow her to set up a small food stand in front of her home. The space was small – only 4 feet by 3 feet – but it allowed Cuc to cook simple dishes and sell to passersby. Her income increased to 30,000 – 50,000 VND per day ($1.30 – $2.20). That amount put food on the table – always enough rice, but the family still depended on the charity of others. Home repairs were left undone. Neighbors bought the girls’ textbooks and school supplies and when sickness came, doctor’s visits were unknown. After village social services recommended Cuc and her husband to Orphan Voice’s Keeping Families Together program and they were accepted, Orphan Voice staff began to meet with the couple and children regularly. A local pastor joined the Orphan Voice team to offer spiritual guidance. Friendships were formed; mentoring began. Experienced mentors counseled Cuc and her husband on the qualities of a good and Godly marriage. They heard for the first time the importance of valuing one another. They also learned positive ways to discipline the girls and the importance of their girls having a good self-image. The couple learned of family budgeting for the first time. When Orphan Voice staff and Cuc discussed how to create more income for the family, everyone agreed that she could expand her food business if she had better tools. To that end, Orphan Voice worked with Cuc to negotiate more space from her neighbor to set up an outdoor restaurant. The KFT program purchased new tables and chairs so that Cuc could serve more customers. KFT also purchased new bowls, cooking utensils and a “cooking cabinet” which allowed Cuc to keep all her ingredients together. The new tools replaced the badly worn (and bad looking) ones; customers noticed the difference. Cuc’s business has grown! The new tables and chairs are welcoming to people as they walk by, and more and more stop for a bite to eat. The “cooking cabinet” gives the food stall a more professional look and, of course, allows Cuc to organize food ingredients and prepare dishes more quickly and easily. She is experiencing something which has not troubled her before: having more sales and income! Cuc now makes from 150,000 to 200,000 VND per day ($6.60 – $8.80)! And the increased income has translated into practical help for her family! The girls have tutors for the first time and their grades have improved. In addition to rice and vegetables, the family eats fish and meat during the week. They’ve been able to repair their old motorbike. Even home repairs are foreseeable. The family is overjoyed! Gone forever is the thought that the girls would be better off in an orphanage! Most children in Vietnamese government orphanages have at least one parent. Sometimes they have two. And for every child in state care, other desperate families press orphanage officials to “take” their children too. Why would parents do that? Perhaps you can guess from Cuc’s story. Poverty, of course, is the main reason. Countryside families, who have a hard time feeding their children, despair. Their religion is about duty and it gives little hope. For some moms, like Cuc, placing their child in an orphanage seems like a “step-up” in that their son or daughter will receive good food and go to school. But caregivers in even the best orphanages know that at night – when the day’s activities are over and before falling off to sleep – children long for their parents. KFT allows them to be home! Our 2018-2019 KFT plans are to reach 1,000 needy children and their moms and dads in Vietnam, Thailand, Nepal, and Laos. Why these countries? Because they have one thing in common: children living in orphanages who should not be there because they have one or two parents. This 18-month KFT program of mentoring, training and income generation assistance will cost $100,000. While we are praying and planning for this expansion, Orphan Voice continues its daily Vietnamese ministry to orphans, special needs children, and children at risk for abuse or trafficking in its established 10 programs. The children and families in these programs are protected and blessed only because of you – our Orphan Voice partners. Can you give generously today to impact Vietnam and Southeast Asia’s “least of these”? To do so make your gift online HERE. Nuong, from a poverty-stricken mountain family, was born deaf and her life has been hard. Her mom, fearing that men would molest her, kept the 23 year old close by her side during her childhood. Before this year, Nuong had only spent one night away from home. As a result, Nuong has spent most of her life looking after the family’s cow and doing other household chores. On a normal day, she walks the cow to pasture – making sure that it doesn’t get into anyone’s crops – and cuts grass for it to eat when pasture is available. In a sense, the family cow became her best friend. Night and day! That’s the difference when comparing Nuong’s old life to her life now! Check it out. The story of her “new beginning” will bless you. Orphan Voice partners provide the ministry of New Beginnings School for the Deaf. You employ two love-filled teachers to minister to Luong and the other students five day each week. New Beginnings School for the Deaf is our most expensive program, per child. For two students, we need to supplement their lunch and transportation. Nuong is one of those two students. Can you sow generously into the lives of these 10 students? Please do. The “trajectory change” for these children is astronomical because of New Beginnings. To help us keep it going and to bless “the least of these,” donate HERE. Hope Therapy Center Is Open! “Joshua” (fictitious name) is a young boy who can’t walk. Before Hope Therapy Center opened, he didn’t receive therapy. Why? Because there was no government or private therapy center within drivable distance from his house. And his parents couldn’t afford to send him to a large city where more help is available. As a result, before Hope Therapy Center, Joshua’s day looked like this. Each morning, his parents put him in a crib on the concrete porch along one side of their house. He stayed in the crib alone all morning until his grandfather arrived at noon to give him some porridge. In the afternoon, “Joshua” was again alone until his parents returned from work around 5:00. The concrete floor and a water hose made for easy cleanup where “Joshua” used the bathroom during the day. But “Joshua’s life has changed because of Orphan Voice partners. He now has a place to receive therapy. A love-filled therapist works to alleviate the problem in his leg that keeps him from walking. It’s life-changing for him. Hope Therapy Center operates ONLY because of you. Can you help us by sowing as generously as you can into this important outreach? To do so, donate HERE. In rural Vietnam and in the Highlands, some children may not have their cleft lip/palate repaired. There are many reasons which force parents this way: 1) being unable to pay the hospital bill or the related travel and food expenses; 2) being unaware of available help; 3) lack of hope among parents that things can be better; and even 4) counsel from village elders to leave “fate alone” (if fate determined that the baby be born that way, don’t interfere with it). But cleft lip and palate repair saves a child from mockery from other children as he/she grows up. In the case of cleft palate repair, it gives the child the chance to speak clearly. The surgery can, of course, be a life saving procedure and, some who need it but don’t get it, die. For these reasons and more, Orphan Voice provides help for families and children who cannot obtain the needed repair on their own. Check out our latest case by clicking on the button below. And please help us do more. The total cost is running about $800. Can you be the reason that another child get his/her surgery? Every gift helps. To bless “the least of these” today, donate HERE. Orphan Voice is excited about June 6 – 17, 2019! That’s the time A Helping Hand adoptees and their families (who the Brewers helped with their adoptions) will visit Vietnam to serve “the least of these.” In fact, we may have two teams! So if you’re an A Helping Hand family looking for a ministry experience in 2019, you’ve found it! Or if you’re one of those beautiful girls, now is your time. Let’s make it full circle! Team activities will include: 1) painting murals; 2) sports; 3) painting classrooms; 4) games and crafts; and more. For a 12-14 day ministry experience (including travel days), one person’s cost for food and hotel will be roughly $500 (plus the air ticket which we are working on). We’ll reserve hotel rooms, provide translators and help at meal time. With a year’s notice, the money can be raised! Email don.secrest@orphanvoice.org to let us know, with no obligation, that you’re interested. You can let us know of your interest, but later drop off the list if need be. God bless! At the beginning of July, we took the 10 students from the New Beginnings School for the Deaf to ‘Happy Heart’, cafe here in Danang, that provides training to deaf people, to work in their cafe. This is where we celebrated the end of the school year, with these students and their amazing teachers. The children loved coming here, as they see how a deaf person can get a great job, without letting their circumstances stop them. Certificates were awarded for the 3 children completing grade 1, and the 7 children completing grade 3, which is an amazing achievement for them all. We feel blessed that they are learning in a safe and positive environment, so thank you to the wonderful people who support the school. Last week, we held an end of the school year celebration for the children from the Promise House. This was an evening to acknowledge their hard work and commitment to their studies, as well as to thank their house mothers for their mentorship and support for their schooling. Every child received an award, specific to their achievements, as well as a small gift. We are so proud of the results and goals they have individually achieved. Education is such a powerful thing, and we feel blessed that thanks to your support, these children are able to gain a great education here in Danang. Last week, 130 of the children from poorer families in the Tam Ky region of Quang Nam province, spent their day on a field trip to Danang. The children included in this day, are determined by the Government, who then pass on the information to us. This was a special day for them, as they visited the Museum, as well as participating in other activities. Orphan Voice was able to support these children, by providing each child with notebooks and a pen, as a small gift for their studies. Nuong, from a poverty-stricken mountain family, was born deaf; her life has been hard. Her mom, fearing that men would molest her, kept the 23 year old close by her side from her childhood days. Before this year, Nuong had only spent one night away from home. Nuong’s mentally ill dad, for different reasons, also forbade his daughter from leaving the house. The “stay at home” rule was iron-clad. As a result, Nuong has spent most of her life looking after the family’s two cows and doing other household chores. On a normal day, she walked the cows to pasture – making sure that they didn’t get into anyone’s crops – and cut grass for them to eat when pasture was not available. In a sense, the family cows became her best friends. A few weeks ago, Nuong’s mom travelled to a Phu Ninh village bank to borrow money. While there, she met an Orphan Voice staff person and told her about Nuong. The staff person referred the family to New Beginnings School for the Deaf. When Nuong learned about the school, her heart leapt. She sensed that this was her path to happiness. Thinking ahead and to remove reasons for her dad to say “no” to New Beginnings, she cut six large bags of grass to “do the cows” for a few days (the bags are about 3 ft. tall and 1.5 feet in diameter). She didn’t want anything to stand in her way! Today Nuong is in school! Because her village home is over an hour away by motorbike, she lives with an Orphan Voice worker during the week. The Orphan Voice worker takes Nuong to New Beginnings each day. If ever a child gained a “new beginning,” Nuong has! You can be sure that your gift to Orphan Voice is changing lives. Every gift matters, and it matters eternally. Bless “the least of these” today! To do so, donate HERE. Nuong at New Beginnings School for the Deaf, With Her Teacher, Hanh. Thanks to James and Betty Robison and Life Outreach International for this van! It will transport special needs children to Hope Therapy Center. Without it, most of them wouldn’t receive therapy because they live too far away. Promise House Group Home children love it too – as you can see! All Hands On Deck! If you’re an A Helping Hand family looking for a family ministry experience in 2019, you’ve found it! Or if you’re one of those beautiful girls who we knew when you were young, now is your time. Let’s make it full circle. From an orphanage to an orphanage! Come, bless “the least of these,” and experience great things in your God. We’re planning for June 2019. Activities include: 1) painting murals; 2) conducting a sports camp; 3) painting classrooms; 4) games and crafts with Promise House children; and 5) possibly medical and dental outreaches. For a 12-14 day ministry experience (including travel days), one person’s cost for food and hotel will be roughly $500 (plus the air ticket). We’ll make all the arrangements and have plenty of translators. With a year’s notice, the money can be raised! Contact don.secrest@orphanvoice.org to let us know that you’re interested. Hieu is six and he’s usually sick with lung inflammation and coughing. He can’t crawl or turn over. He’s never had therapeutic help and mostly just lies on his mat all day. His elderly grandmother looks after him during the day while his parents work. Occupational Therapist, Caroline Mrowiec, prayerfully interviewed Hieu and his family last week. The good news is that Hieu is accepted into Hope Therapy Center’s program! He’ll start this month. Please pray for him! Caroline will be ministering to other children at Hope Therapy Center. Some will be like Hieu and others will have less severe needs. To support Orphan Voice’s newest outreach to special needs children, sow your gift HERE. All Hands On Deck! If you’re an A Helping Hand family looking for a family ministry experience in 2019, you’ve found it! Or if you’re one of those beautiful Chinese girls that we knew when you were young, now is your time. Come, bless “the least of these,” and experience great things. Let’s do it. We’ve made preparations. Over the next sixteen years, answering that question not only led to that couple adding to their family, but also Cindy and I adopting five beautiful daughters. It also gave us the privilege of helping over 1,000 couples give homes to needy children who formerly lived in developing country orphanages. After visiting a few of those orphanages early on, we determined to empty as many of them as we could. Answering that question eventually led to the founding of Orphan Voice and our move to Asia. With that background, when Cindy and I moved to Vietnam, our purpose in coming was a fuzzy idea of “orphan care.” So, when Vietnamese officials asked us to operate a struggling orphanage, we took on the job. Promise House Group Home still operates for selected children – with your help. But our thinking about orphan care best practices changed over time. Gradually, it became clear that even a “good orphanage,” except in certain cases, wasn’t good at all. Our earlier idea to empty orphanages in developing countries had been the right one! With expertise provided by Orphan’s Promise in Virginia Beach, Virginia, we determined to help families in crisis before they felt pressured to turn to an orphanage for help. Thus, our Keeping Families Together (KFT) program was born. Vinh and his wife, Hanh, always fought. Vinh cut his wife off emotionally, and when he did talk to her, it was usually in anger. Chronically sick and unable to hold a regular job, Vinh couldn’t earn the money that his family needed. That added anger and frustration to both their lives. The children suffered too. They were sometimes hungry. Their oldest son dropped out of school. The girls did poorly in school and did not have tutors (the normal practice), because the family could not afford tutors. At one point, Vinh and Hanh decided to place their daughters in an orphanage. But village leaders knew of Orphan Voice’s Keeping Families Together program and recommended the family to it. With some reluctance, Vinh and Hanh applied and were accepted. Orphan Voice Christian workers began to visit, counsel and encourage Vinh and Hanh. They got to know the couple well and Vinh and Hanh shared their deepest feelings. Over several months, the workers shared practical ways for Vinh and Hanh to love one another, to develop a better marriage and to become better parents. KFT paid for Vinh to go to the hospital. While still not 100%, he’s better today. 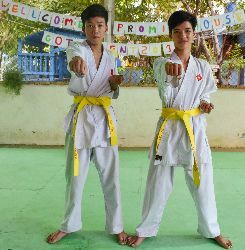 KFT also helped Vinh and Hanh make more money. The couple knew how to raise chickens, geese and pigs. Building on those skills, the KFT program purchased a pregnant “seed-sow” as well as “seed-ducks and chickens.” Vinh and Hanh were faithful in their care for the animals and soon pigs, chickens and ducks were everywhere! The family ate some, sold some for cash, but still the numbers grew. With a KFT-provided electric bicycle, Vinh’s 17-year-old son could reach a swampy area several kilometers away and collect snails to sell. In this way, he made 250,000 Vietnam dong ($11) per day for the family – an unheard of amount. In short, the family has prospered as never before. Through the ministry of Orphan Voice Vinh, Hanh and their children’s lives have changed. Vinh and Hanh smile and laugh more often. Their children are happier. The girls have tutors. Food is always on the table. Best of all? The idea of sending their two beautiful daughters to an orphanage is gone forever! Orphan Voice reaches families like Vinh and Hanh’s only because of you. Your gift changes lives. Will you help us today? To sow love and hope into the lives of needy families, donate HERE. From health as an infant, to near death as a nine-year-old, and back to health again through love and therapy, Binh has experienced a miracle. Watch and rejoice with him! Special needs children are special. Help us minister to them today by investing in their lives HERE. Nuong is our most recently admitted student. Unusually, she’s older than the others. In fact, she’s in her 20s. How did she come to attend? Intense desire drove her! In short, Noung implored the teacher to be allowed to attend. In the face of such importunity, she was admitted. New Beginnings School for the Deaf is a small school, in a small place, serving a small group of children. In the world’s estimation, it holds out small expectations. But for 10 deaf children, New Beginnings is the most important place in the world. For them, it unlocks a future that is good and exciting. These guys are worth it! There’s room for you to help change their lives. To sow your investment today, donate HERE.